One in every three people age 65 or older falls each year, making falls the most common cause of injuries and hospitalizations for trauma in older adults and the leading cause of death due to injury (CDC, 2006). Researchers have studied falls, fall risk assessment, and interventions to prevent falls. However, to date, their methods require that research staff or clinicians complete multi-factorial assessments of fall risk and that research subjects maintain logs of falls, wear devices that measure changes in positions that could indicate a fall or activate an alarm that they need assistance. Building on our current work, we propose to validate and deploy an innovative technological approach that automatically detects when falls have occurred or when the risk of falls is increasing. Subjects will not have to press buttons, pull cords or wear any devices. This new “passive” approach using sensors in the home could revolutionize detecting and preventing falls as well as measuring fall risk. By detecting falls or increasing fall risk early, this new technology can act as a trigger for elders, family members, or health care providers to improve physical function or better manage illnesses that are precipitating falls. The products of this study can improve access to fall risk measures by deploying the new sensor system in any private house or apartment as well as senior centers, churches, or retail stores. 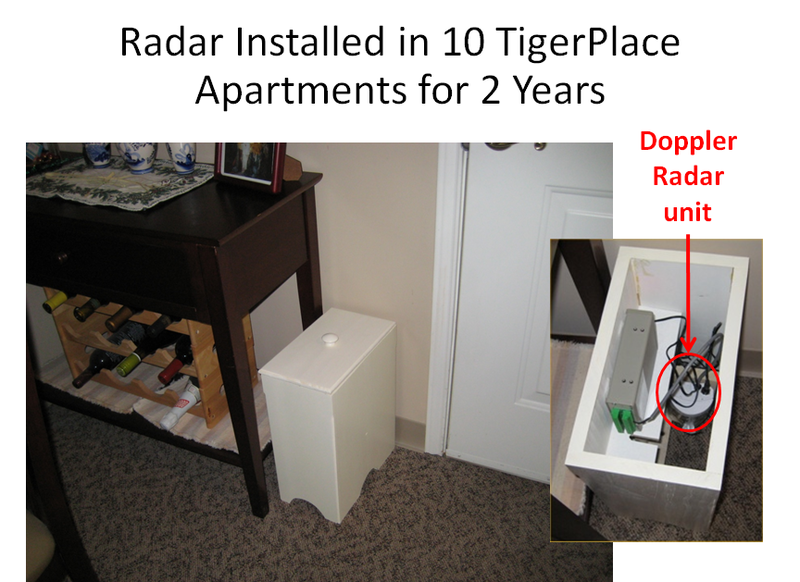 Systems were installed in 10 TigerPlace apartments for 2 years using radar, webcam, and Kinect depth cameras. Silhouettes were extracted from the vision systems for privacy protection. Once a month, trained stunt actors came into the apartments and fell, using 21 different types of falls. Once a month, each resident was directed through a set of standard fall risk assessments to capture ground truth on fall risk. Data collected in the apartments were used to develop robust algorithms for fall detection and walking gait, without requiring any on-body sensors. Using this unique dataset, we were also able to map average in-home walking speed to the standard Timed Up and Go (TUG) fall risk assessment that has been validated with numerous subjects. Yardibi T, Cuddihy P, Genc S, Bufi C, Skubic M, Rantz M, Liu L & Phillips C, “Gait Characterization via Pulse-Doppler Radar,” Proceedings, 9th Annual IEEE International Conference on Pervasive Computing and Communications: Workshop on Smart Environments to Enhance Health Care, Seattle, WA, March 21-25, 2011, pp 662-667. Liu L, Popescu M, Skubic M, Rantz M, Yardibi T & Cuddihy P, “Automatic Fall Detection Based on Doppler Radar Motion Signature,” Proceedings, 5th International Conference on Pervasive Computing Technologies for Healthcare, Dublin, Ireland, May 23-26, 2011, pp 222-225. Liu L, Popescu M, Rantz M & Skubic M, “Fall Detection using Doppler Radar and Classifier Fusion,” Proceedings, International Conference on Biomedical and Health Informatics (BHI 2012) Hong Kong and Shenzhen, China, January 2-7, 2012, pp 180-183. Cuddihy PE, Yardibi T, Legenzoff ZJ, Liu L, Phillips CE, Abbott C, Galambos C, Keller J, Popescu M, Back J, Skubic M & Rantz MJ, “Radar Walking Speed Measurements of Seniors in their Apartments: Technology for Fall Prevention,” Proceedings, 34th Annual International Conference of the IEEE Engineering in Medicine and Biology Society, San Diego CA, August 28-September 1, 2012, pp 260-263. Liu L, Popescu M, Ho KC, Skubic M & Rantz M, “Doppler Radar Sensor Positioning in a Fall Detection System,” Proceedings, 34th Annual International Conference of the IEEE Engineering in Medicine and Biology Society (EMBC’12), San Diego, CA, August 28 – September 1, 2012, pp 256-259. Phillips III CE, Keller J, Popescu M, Skubic M, Rantz MJ, Cuddihy PE & Yardibi T, “Radar Walk Detection in the Apartments of Elderly to Assist with Assessing Fall Risk,” Proceedings, 34th Annual International Conference of the IEEE Engineering in Medicine and Biology Society (EMBC’12), San Diego, CA, August 28-September 1, 2012, pp 5863-5866. Liu L, Popescu M, Skubic M & Rantz M, “An Automatic Fall Detection Framework Using Data Fusion of Doppler Radar and Motion Sensor Network,” Proceedings, IEEE International Conference of the Engineering in Medicine and Biology Society, Chicago, IL, August 26-30, 2014, pp 5940-5943. Wang F, Skubic M, Rantz M, Yardibi T & Cuddihy PE, “Quantitative Gait Measurement with Pulse-Doppler Radar for Passive In-home Gait Assessment,” IEEE Transactions on Biomedical Engineering, 2014, 61(9):2434-2443. 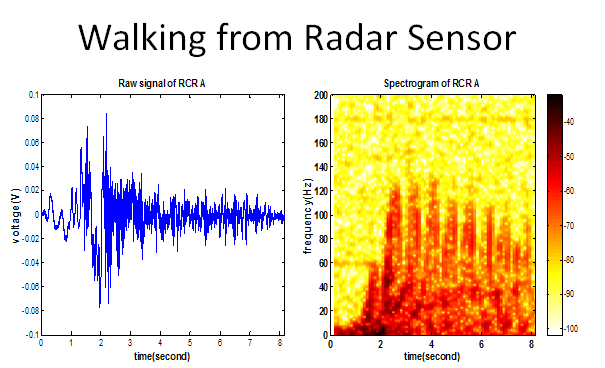 Su BY, Ho KC, Rantz M & Skubic M, “Doppler Radar Fall Activity Detection Using the Wavelet Transform,” IEEE Transactions on Biomedical Engineering, 2015, 62(3):865-875. L. Liu, M. Popescu, M. Skubic, M. Rantz, and P. Cuddihy, “An Automatic In-Home Fall Detection System Using Doppler Radar Signatures,” Journal of Ambient Intelligence and Smart Environments, in press, 2016. Rui L, Chen S, Ho KC, Rantz M, & Skubic M. “Estimation of human walking speed by Doppler radar for elderly care,” in press, 2016, Journal of Ambient Intelligence and Smart Environments.